June 24, 2016 (Longmont Colorado, USA) What better way to ring in a decade of memorable racing than to shake things up a bit? 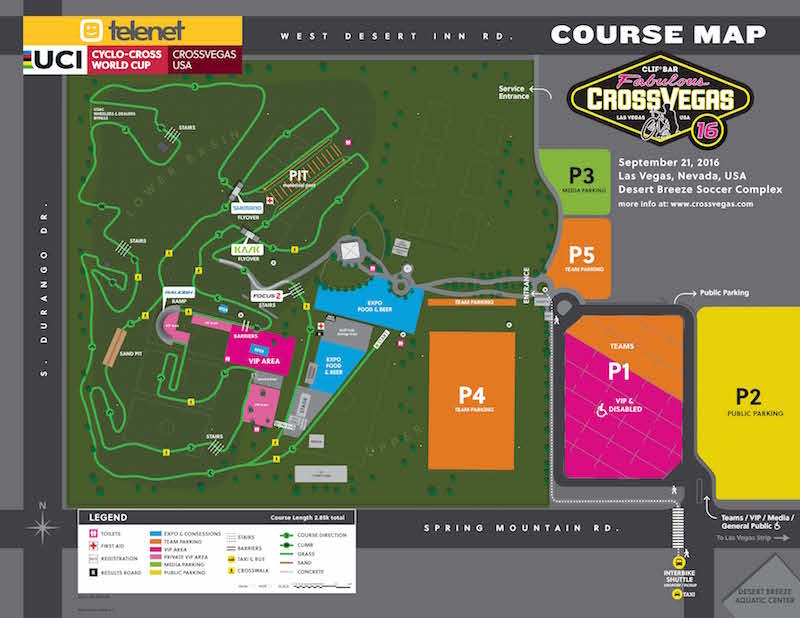 To mark the tenth edition of the biggest ‘cross race outside of Europe, organizers of Clif Bar CrossVegas announced big changes to the venerable race course at Desert Breeze Soccer Complex in Las Vegas. The thick grass that every CrossVegas racer already knows too well hasn’t been eliminated, and the tough uphill sections have not been removed. Instead, the racing action has been moved almost exclusively into “The Bowl,” the iconic depression that defines the venue. Only the start and finish sections bring racers out of the bowl ensuring even more concentrated action for spectators attending the first race of the Telenet UCI World Cup Cyclocross series on Wednesday, September 21. Racers in the USA Cycling and Wheelers & Dealers races will be pleased to learn that a short cut has been created to spare them the toughest section of downhill and uphill racing. That decisive section will be faced by Elite Women and Men in the World Cup races later in the evening. The course direction is largely reversed from previous years. After all the action in The Bowl, the racers face the Focus Bikes Stairs, just before the final sprint to the finish line. The new course design enhances the spectator and VIP experience with an expanded expo area, a greater food selection and new strategically placed beer tents. In 2015 racers from 21 nations competed in the first World Cup held outside of Europe. The Women’s Elite was won by Katerina Nash of the Czech Republic and the Men’s Elite was won by Wout Van Aert of Belgium. Both Nash and Van Aert are expected to compete in 2016.